After celebrating papa's birthday on the fourth, I attended William Z. Villain's release show on the evening of the fifth. 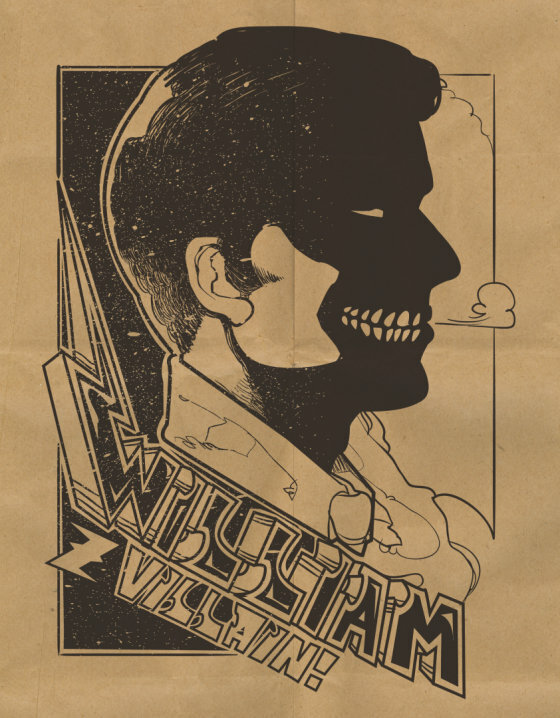 William Z. Villain is headed by Bill Villain, a friend from high school. He's crazy talented, and a joy to watch perform. Openers were Dog Hotel and Dharmonic Deluxe. There were some neat graphics projected on the wall during the performances. I was sure to pick up a physical copy of William Z. Villain's EP, though download codes were available for purchase as well. The CD came wrapped in a limited edition print - on Woodmans paper bags! Mine's hanging up on my wall in my room. Can you see the resemblance to the real Bill Villain? (Note: He's not really a villain -- he's very nice). The one and only Dan Collins and a Piano was in the audience that night, so Bill Villain invited him to come play piano during one of their songs -- a fun surprise! I have no visual evidence, but it did happen. If you missed the show, you can purchase the digital album and download William Z. Villain's tracks here! *Warning: Listening to this song may result in you belting "I stole a car and I drove off a cliff" all day in your office, and your coworkers may think you're a bit cray-cray.